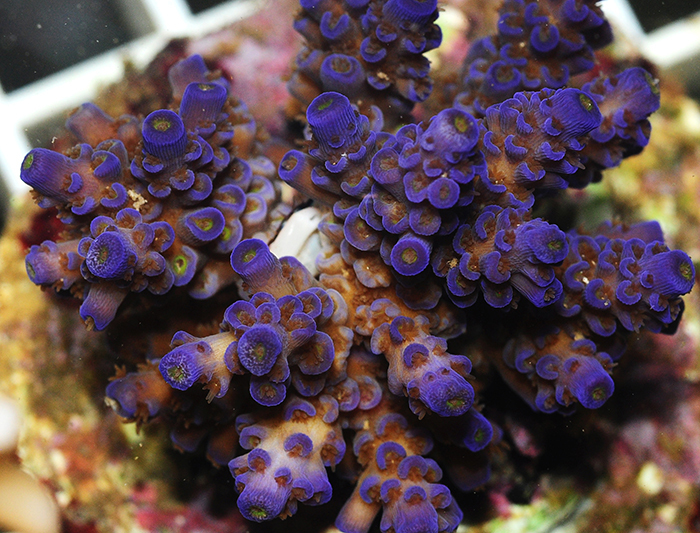 By Tim Wijgerde, Ph.D. Light is one of the most discussed topics in the marine aquarium hobby. It is also amongst the most dreaded, due to its complicated nature. 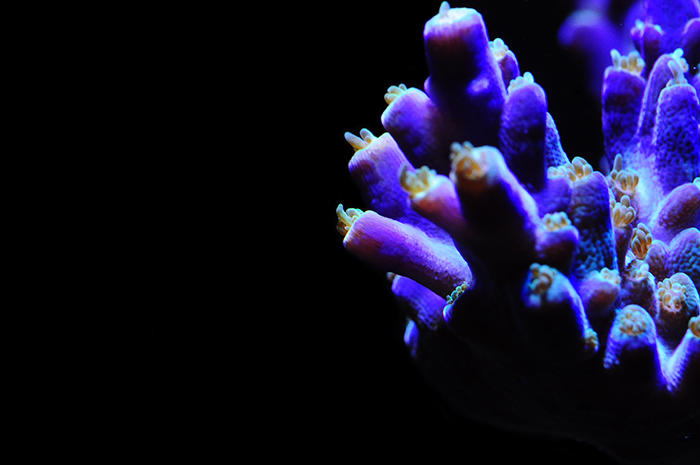 In this article, I will explain the basics of light, including luminous flux, PAR, PUR and spectrum, and discuss how corals respond to various light regimes. I will continue with describing the light environment corals are exposed to in the wild. I will end with describing how to measure and interpret light intensity in reef tanks. First, let’s ask ourselves, “What is light?” What we call light in everyday life is electromagnetic radiation which our eyes can detect. Electromagnetic radiation consists of tremendously small particles, known as photons. When traveling through any space, photons move up and down, somewhat like a car moving left to right on a freeway. The number of times photons move up and down each second is known as their frequency, and this determines whether photons form radio waves, microwaves, infrared light, visible light, ultraviolet light, X–rays or gamma radiation. Visible light is formed by photons having a specific frequency range within the electromagnetic spectrum. Radio waves consist of low frequency photons, whereas gamma radiation is formed by the most energetic, high frequency photons. The photons which make up visible light lie somewhere in the middle, in terms of their energy and frequency. Light is a crucial factor for reef–building corals, providing them with the energy required to build vast reefs. Photo by Tim Wijgerde. Next to frequency as a property of different types of electromagnetic radiation, wavelength is important to discuss. Wavelength is the distance a photon travels during one oscillation, so when the photon has moved up and down once. The graph below illustrates the wavelength of a single photon, moving up and down. The shorter the wavelength, the faster the photon moves and up down. In other words, the shorter the wavelength, the higher the frequency. Wavelength and frequency, therefore, are always inversely correlated. Blue photons, for example, move up and down faster than red photons. Thus, blue photons have a shorter wavelength, higher frequency and more energy compared to red photons. Visual representation of wavelength, denoted by the Greek letter lambda, λ. The distance a photon travels when completing one oscillation is a single wavelength. As a photon travels through a space, countless oscillations, or wavelengths, form a so–called sine wave pattern. 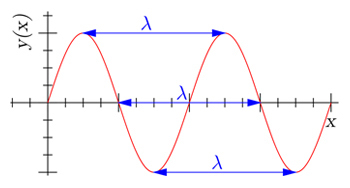 The three wavelengths denoted above are of equal value, but start in a different phase of the sine wave. Image by Dicklyon (Richard F. Lyon), CC BY–SA 3.0, Wikimedia Commons. The visible light spectrum can be divided into several main colors, including violet, blue, green, yellow, orange and red. The boundary between two given colors is somewhat arbitrary, as they blend with one another. 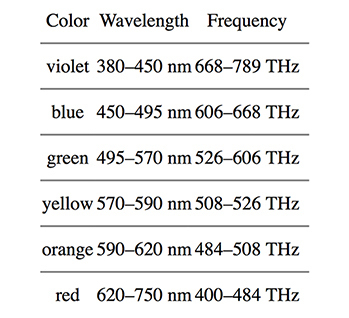 However, for practical reasons, wavelength and frequency boundaries for different colors have been defined, as shown in the table below. Overview of the visible light spectrum, ranging from violet (V), blue (B), green (G), yellow (Y), orange (O) and red (R). Image by Gringer, Public Domain, Wikimedia Commons. Table 1. Overview of the wavelength range for each major color. Note that wavelength and frequency are inversely correlated; the higher the frequency (expressed as trillion oscillations per second, or Terahertz), the shorter the wavelength (expressed as distance in nanometers, or nm). Light Spectrum, Color Temperature and Light Intensity Now that we know what light basically is, namely a form of electromagnetic radiation our eyes can perceive, let’s continue with light spectrum, color temperature and light intensity. The most famous and arguably most brilliant scientist in modern history, Isaac Newton, proved that white is composed of all known colors. By using a prism, Newton split light into the entire visible spectrum. The same phenomenon occurs when sunlight hits rain, causing rain droplets to split the light and forming a rainbow. When we take an artificial light source, such as an aquarium lamp, we can also analyse the color composition, or spectrum, emitted by that light source. Although we could use a prism, nowadays we have sophisticated devices known as spectrometers, which can detect any light spectrum and visualize it with a computer graph. An example is the graph below, which shows the spectra of an LED light and plasma light. Spectral analysis of an LED light (plotted in blue) and plasma light (plotted in red) using a Jaz spectrometer (Ocean Optics). Note that the LED light emits lots of blue light (around 450 nm), whereas the plasma light has a more balanced spectrum and also emits UV (750 nm) Image by Tim Wijgerde. As living organisms respond differently to various light spectra (see below), including the fishes and corals we keep in our tanks, it makes sense to analyse the spectrum of a given light source to determine whether it is appropriate for a given application. In the marine aquarium hobby, we mostly make use of light sources with spectra that are skewed towards the blue/violet end. This is more natural (also see below), but also gives a more aesthetic appearance, as blue and violet promote the fluorescent colors of marine life. Lamp manufacturers often report the spectrum emitted by their products, to allow consumers to make a more informed choice. Oftentimes, manufacturers also report the color temperature of the lamp, expressed in Kelvin. This color temperature is the perceived overall color of the lamp when compared to light radiated by a so–called black body at the same temperature. The higher the temperature of the black body, the more the emitted light spectrum shifts to the blue end of the visible spectrum. Thus, aquarium lamps with low color temperatures emit reddish light, whereas those having high color temperatures emit whiter, or even bluish light. The limitation of using color temperature as a measure for light quality is that it gives no details of the spectrum emitted by a given light source. Using color temperature is useful only when one would like to have a general idea of what the light emitted by an aquarium lamp will look like. For example, 10,000 Kelvin lamps, be it metal halide, T5 or LED, emit cold white light. Lamps around 5,500 to 6,500 Kelvin are usually called daylight lamps, and emit neutral white light like the sun. Lamps with a Kelvin rating of 20,000 K or higher emit very blue light. The spectral quality of light has a significant impact on how our eyes perceive corals. 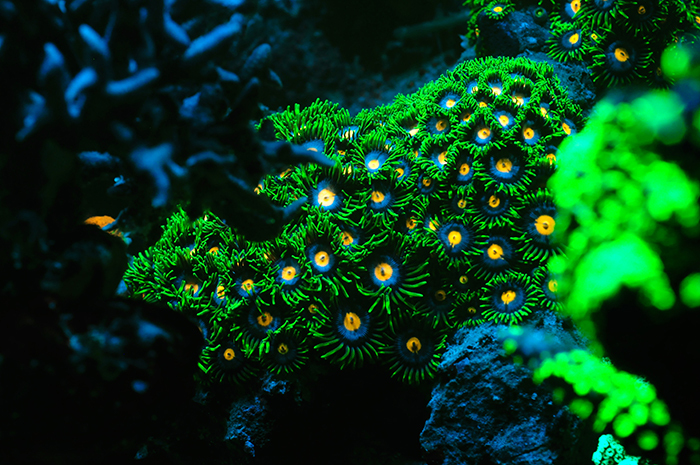 This Zoanthus colony lights up under blue light, which excites the coral’s fluorescent pigments. Photo by Tim Wijgerde. Light intensity is another important aspect of a light source. Several units have been defined to quantify light intensity, and I will not discuss all of them here. Before moving on to the most relevant quantity and unit for aquarium purposes, let me first discuss lux and lumen. Lumen is a unit which quantifies luminous flux, so the total amount of light emitted by a light source at a wavelength of ~550 nanometers. So, lumen is based on green light, to which our eyes (when daylight acclimated) are most sensitive. Lux is similar to lumen, in that it quantifies the total amount of lumens emitted by a light source at a surface area of one square meter (m2). This distinction is relevant, as it allows us to compare non–focused to focused light. For example, a fluorescent tube without a reflector emits all its light in 360 degrees around itself, whereas a 60 degree aluminum reflector would focus that light into a much smaller angle. In that case, the amount of lumens produced by the fluorescent tube would remain equal, whilst the amount of lux would significantly increase as the light would be focused on a much smaller surface area. Here’s where the lumens story has to end for us. As I mentioned, lux and lumen are based on ~550 nanometers, so green light only. Although luminous flux and its units are useful in terms of quantifying how bright a light source will appear to the human eye, it fails to predict how plants and animals will respond to a light source. For example, the corals which we keep in our tanks often host symbiotic dinoflagellates (zooxanthellae), which use much more than just green light to fuel photosynthesis. Photosynthesis is a biochemical process which converts light energy into chemical energy, and takes place inside of plants, some bacteria and of course zooxanthellae. Thanks to this process, corals receive lots of chemical energy from their zooxanthellae in the form of sugars, fats and amino acids, allowing them to grow. Although green light does stimulate photosynthesis, it is not as efficient as red, blue or violet light, which is absorbed more effectively by the zooxanthellae’s photosynthetic pigments. Interestingly, the light sensitivity of the human eye and that of plant photopigments show an approximate inverse relationship! For this reason, we have to abandon lux and lumen to quantify the light intensity of our aquarium lamps, and instead opt for a quantity and unit which account for all the colors in the visible spectrum. In short, the adage lumens are for humans applies here. Lumens are useful to humans, having retinas most sensitive to green light. Zooxanthellate corals, however, make use of far more than just the green part of the light spectrum to drive photosynthesis. Photo by Tim Wijgerde. The quantity we should be more interested in is known as photosynthetically active radiation, abbreviated to PAR. Its unit is expressed as micromol photons per square meter per second (µmol m–2 s–1), where the photons are in a wavelength range which stimulates photosynthesis (~400–700 nm). A micromol is a given amount of photons, namely 6.02 * 1017 photons. In other words, a six with seventeen zeroes, quite a large number. This all sounds quite complex, so just remember it like this: when we measure PAR, we simply measure a “rain” of photons of all visible colors onto a surface area. The higher the PAR value, the more intense this rainfall is, and thus the more photons rain onto the surface area every second. Another quantity which is sometimes used in the marine aquarium is PUR, or Photosynthetically Usable Radiation. PUR has been devised as a quantity which specifically looks at which colors can be used by a photosynthetic organism, such as a plant or coral. For example, if we consider two light sources emitting equal PAR (micromol photons per m2 per second, wavelength range ~400–700 nm), where one which emits photons mostly in the blue range (450 nm), and the other green photons (550 nm), we would consider the first lamp to provide more PUR, as corals (read: zooxanthellae) can use blue light more effectively than green light. Although PUR is a useful concept to consider when choosing a light source, the term itself is a bit of a misnomer in my opinion. This is because all PAR, that is photons in a wavelength of about 400 to 700 nanometers, is usable radiation. Thus, when you take the terms literally, all PAR is PUR. This is because corals, and plants for that matter, have evolved a whole array of photopigments which allow them to absorb and use any given color within the visible light spectrum. It’s just that not all wavelengths (i.e. colors) stimulate photosynthesis equally efficiently, which is depicted in the graph below. This graph shows the action spectrum of zooxanthellae, so the degree to which a given wavelength of light stimulates photosynthesis. It is important to note that this curve is based on measurements of an Acropora sp. Fortunately, although the action spectra of different coral species and their zooxanthellae vary, they are quite similar, so the curve below gives a good impression of how the average coral responds to various colors in terms of photosynthesis rates. As we can see, all colors stimulate photosynthesis by the zooxanthellae in this Acropora. Even green light (495–570 nm) can play a significant role in stimulating photosynthesis if it’s provided, although its efficiency dramatically declines as we near the yellow part of the spectrum. In fact, green light around 500 nm is almost as efficient in stimulating photosynthesis as red light at 670 nm. This is why we should not dismiss the role of green light in coral photosynthesis too quickly. Action spectrum of an Acropora sp. normalized to photosynthesis response at 675 nm, and spectral ranges for photosynthetically active radiation (grey area) and luminous flux (arrow). Note that all colors stimulate photosynthesis, including green, with violet and blue being most effective. Image by Tim Wijgerde, adapted from Kühl et al. (1995). As PUR can be a confusing term, perhaps it should be renamed to something like PAR–E, the E standing for efficiency. Just keep in mind that when measuring PAR, i.e. 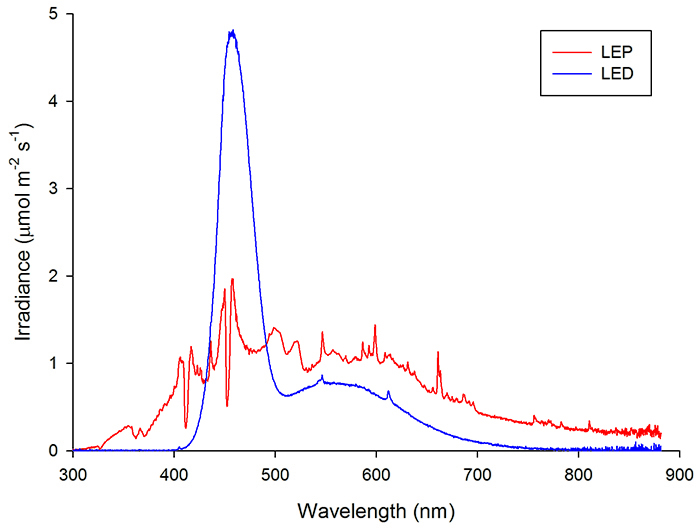 light intensity within the spectral range relevant to photosynthesis, it is useful to also have details about the spectral properties of the light source. Blue is most important to corals and zooxanthellae (also see below), in terms of photosynthesis and stimulating zooxanthellae growth in the long run, followed by the remaining colors in arbitrary order. Nowadays, most light sources have a continuous spectrum, i.e. containing all visible colors, with a curve skewed towards the blue and violet. This is both attractive and quite natural, although what is natural depends on water depth (see below). Coral Response to Spectrum and Light Intensity Let’s continue with a recap. We know that all colors stimulate photosynthesis in zooxanthellate corals, and we also know that photosynthesis is a major driver of coral growth, as it provides corals with lots of energy in the form of organic compounds. Since the 1980’s, biologists have tested the effects of various colors on coral/zooxanthellate growth and photosynthesis. Kinzie and colleagues (1984, 1987) were amongst the first to expose corals to filtered sunlight, and compared the effects of blue, green and red light to those of full spectrum sunlight for a period of several months. What they found was that blue light by itself supported coral and zooxanthellae growth (Pocillopora damicornis and Montipora verrucosa) equally well when compared to full spectrum white light, provided that the same amount of light was used (i.e. equal PAR and photoperiod, but different spectrum). Green and red light were significantly less able to promote coral and zooxanthellae growth. Interestingly, green light did promote photosynthesis as well as blue, red or white light, in agreement with the action spectrum measured by Kühl et al. (1995) above. In 2012, my colleagues and I conducted a similar experiment at the coral lab of Wageningen University (The Netherlands) in collaboration with Philips Lighting, and obtained similar results for Stylophora pistillata. Over a period of six weeks, blue light by itself resulted in corals with similar health, zooxanthellae growth and chlorophyll densities as compared to white light. Under red light only, however, many corals died, with the remaining living tissue exhibiting reduced zooxanthellae density and less chlorophyll. We also found that when blue and red light are combined, red acts dominantly over blue light to actively repress chlorophyll synthesis. 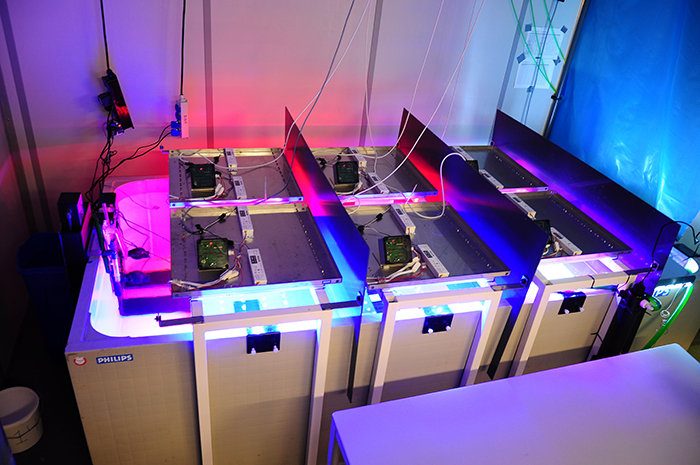 Setup used to determine the effects of light spectrum on the photobiology of Stylophora pistillata at Wageningen University. Photo by Tim Wijgerde. So, even though every single color within the visible light spectrum can be beneficial to corals and zooxanthellae in terms of promoting photosynthesis, the presence of blue light seems essential to grow them in the long run. This theory is supported by an experiment by Wang and colleagues (2008), who found that blue light is important for healthy growth of isolated zooxanthellae. Again, under white and blue light, zooxanthellae isolated from Euphyllia glabrescens grew equally well, whereas they exhibited disrupted growth under red light alone. The stimulating effect of blue light on corals and their zooxanthellae may be explained by blue light–sensitive proteins on their cell surface, known as cryptochromes. These proteins are found in dinoflagellates, plants and animals, including humans, and are known to regulate 24–hour (circadian) rhythms. The repressing effect of red light is likely explained by red–sensitive proteins known as phytochromes, which regulate many processes in plants including chlorophyll biosynthesis. Now the important question is, why are corals and their zooxanthellae so dependent on blue light? And why does red light act as a “brake” on chlorophyll synthesis? The answer must lie in the natural environment of reef–building corals, and their adaptation to it. Indeed, blue light penetrates deepest in seawater, and is present in the entire photic zone (0–667 feet or 0–200 meters), so it makes sense that zooxanthellae have evolved to use it effectively. Red light, on the other hand, is only present within the first 33 feet (10 meters) or so (also see below). This means that the presence of red light coincides with high light levels. It is possible that corals and zooxanthellae use red light as an indicator for a high light environment, where red lights acts via phytochrome receptors to reduce chlorophyll synthesis. This “emergency brake” on chlorophyll synthesis may prevent zooxanthellae and their coral hosts from excessive light stress (i.e. oxygen intoxication due to very high photosynthesis rates) in shallow water. 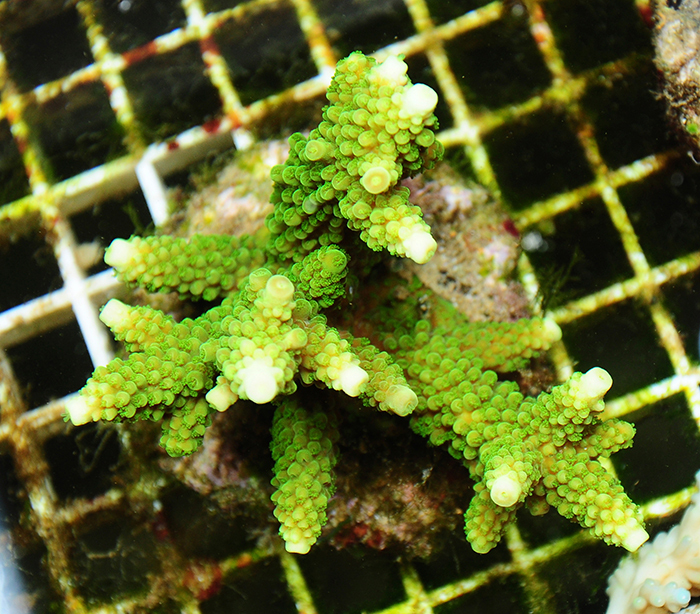 Reef–building corals such as this Montipora sp. may use red light as an emergency brake signal, allowing them to adapt to shallow waters with bright light. Photo by Tim Wijgerde. Before we look deeper into this matter, let’s first look at the effects of light intensity, or irradiance, on coral growth. It is known that stony corals can adapt to a wide variety of light levels in aquaria, although their growth rates and coloration are not always maintained at lower levels. 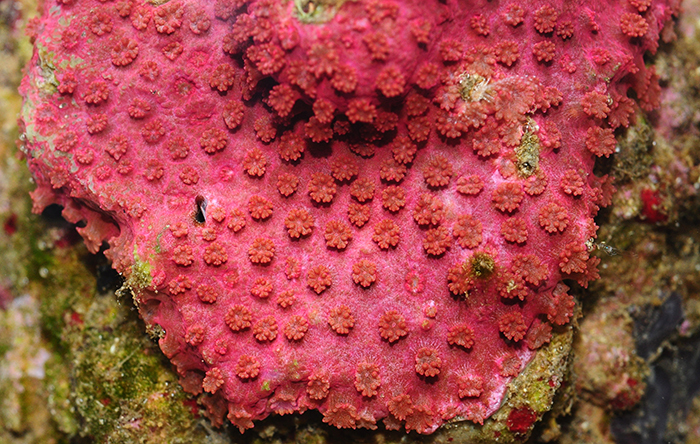 To provide some examples: after an acclimation period of several weeks, a PAR value of 400 µmol m–2 s–1 is sufficient to near–saturate photosynthesis in several coral species such as Galaxea fascicularis, Seriatopora caliendrum and Pocillopora damicornis, although some species require more light for this to occur. It must be noted, however, that even these corals may saturate at lower levels when acclimatized longer to low light intensities. In addition, each genetically unique individual within a species may behave differently. 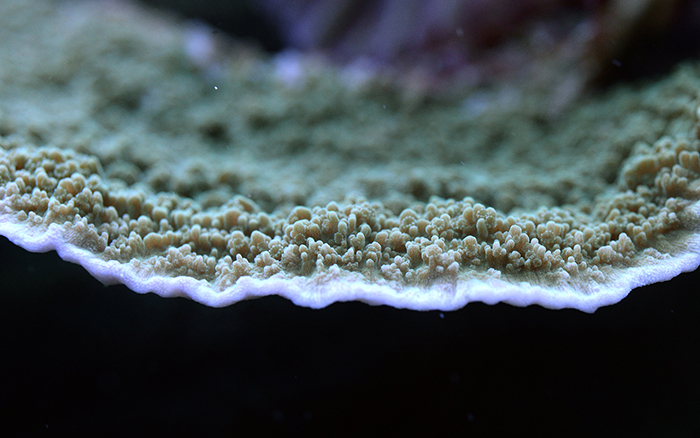 In terms of growth, Montipora aequituberculata already shows a growth saturation at 40–60 µmol m–2 s–1, although other species such as Acropora millepora growth–saturate at higher light levels of 300 µmol m–2 s–1 and beyond. It must be noted that at higher irradiance levels, corals can become stressed. This is especially true when water flow rate is too low, preventing the coral from releasing excess heat and oxygen produced through photosynthesis. Photosynthesis rates (black line and dots) and growth (grey bars) of Galaxea fascicularis under various light levels. At 400 µE m–2 s–1 (µmol m–2 s–1), photosynthesis and growth have near–saturated. Image by Schutter et al. (2008). In terms of coral coloration, high light intensities are required for the production of several green and red fluorescent proteins, and non–fluorescent chromoproteins. PAR levels of at least 700 µmol m–2 s–1 are required to saturate the bright pigmentation of Seriatopora hystrix, Acropora pulchra and Acropora millepora. Research has shown that it is blue light specifically which evokes this colorful pigment production. Although these bright colors are coveted by aquarists, and even natural (depending on depth), it is important to realize that colorful corals are actually displaying a stress response and protecting themselves from excess light. Again, strong water motion alleviates physiological stress. 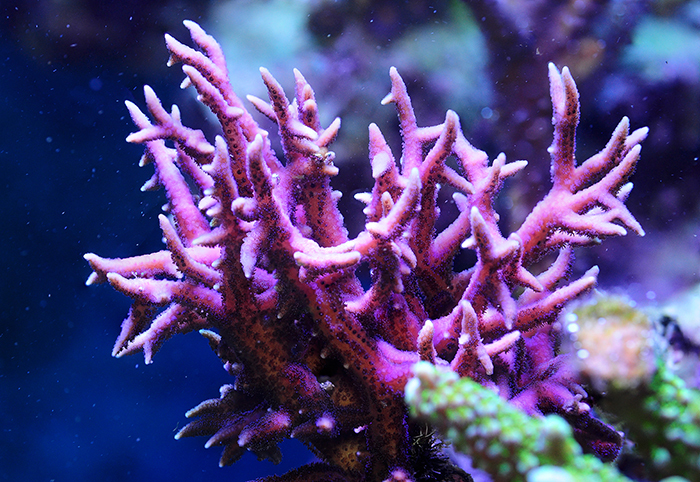 At high irradiance levels, many corals such as this Acropora produce colorful fluorescent pigments. Photo by Tim Wijgerde. Members from the Pocilloporidae, including this Seriatopora hystrix, produce non-fluorescent chromoproteins under bright light. Photo by Tim Wijgerde. Light Intensity and Spectrum on Coral Reefs Now that we have some idea of how corals respond to light quality and quantity, let’s take a closer look at the natural environment of our corals. In the ocean, both the intensity and spectral quality of light are affected. The deeper one goes, the lower the light intensity, as light is absorbed and scattered by seawater. On a sunny day in the tropics, around noon, light intensity at the surface is about 2,400 to 2,600 µmol photons m–2 s–1, measured as photosynthetically active radiation. At 17 feet (5 meters) depth, light intensity has already decreased to about 1,000 µmol photons m–2 s–1, and at a depth of 200 feet (60 meters), irradiance has dropped to only 50 µmol photons m–2 s–1. 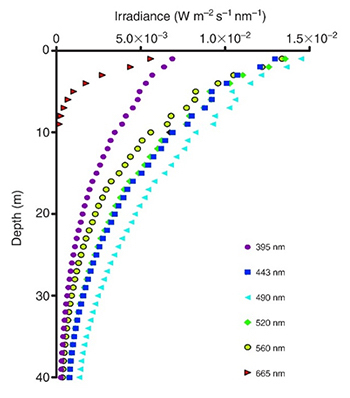 For comparison, most reef aquaria experience light intensities in the range of 100 to 1,000 µmol photons m–2 s–1, corresponding to water depths of approximately 133 to 17 feet (40 to 5 meters). It must be said that in the field, the irradiance profile is parabolic, i.e. light intensity is low in the morning and evening, and peaks at midday. Light levels are also significantly affected by season, latitude and weather. On a cloudy day or during storms, for example, significantly less light penetrates the water, which also shifts to the blue end of the light spectrum. Water clarity also affects light penetration, and therefore the maximum depth at which we find reef–building corals. 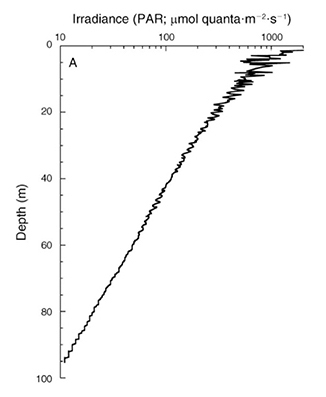 Irradiance depth profile between 0 and 95 m (0–317 ft.) at Bock Wall, Lee Stocking Island, Bahamas. 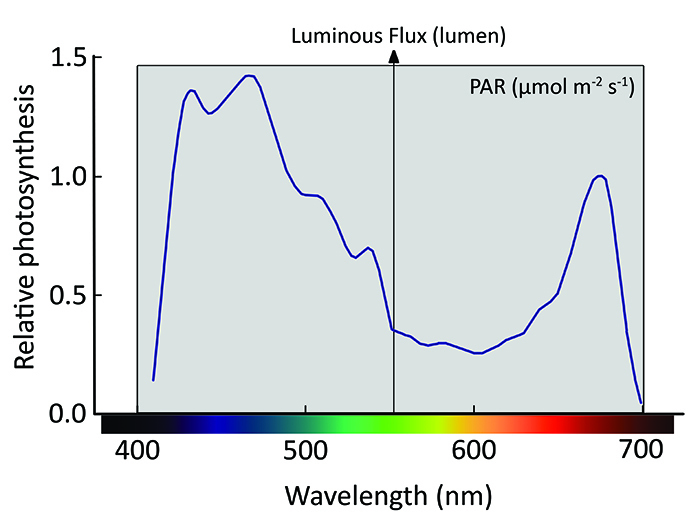 Surface irradiance was 2,478 µmol photons m–2 s–1 (~400–700 nm). Note that the x–axis is plotted on a log scale, resulting in a straight curve. Image by Lesser et al. (2010). As reef–building corals are found in a wide depth range, from 0 to about 165 meters (550 feet), depending on location, they are exposed to light intensities varying three orders of magnitude. Corals growing in intertidal zones are exposed to air and bright sunlight several times a day during low tide, with light intensities up to about 2,600 µmol m–2 s–1 as photosynthetically active radiation. Such exposure to very high irradiance is stressful to the corals, as their symbiotic zooxanthellae receive so much light that it saturates and even damages their photosynthetic machinery. To cope with this excess of (UV) light, both the corals and zooxanthellae utilize several mechanisms to prevent tissue damage. These include the synthesis of light–protective proteins such as mycosporin–like amino acids (MAA’s) and fluorescent proteins by the host coral, polyp retraction to shade zooxanthellae from excess light, fluorescence of harmful UV radiation as yellow light by the coral skeleton, dissipation of excess light energy as heat by zooxanthellae, and constant (nightly) chemical repair of the zooxanthellae’s photopigments. Thus, corals do not require the excessive light intensity found in shallow water, but rather have to cope with it, and thrive at lower irradiances. 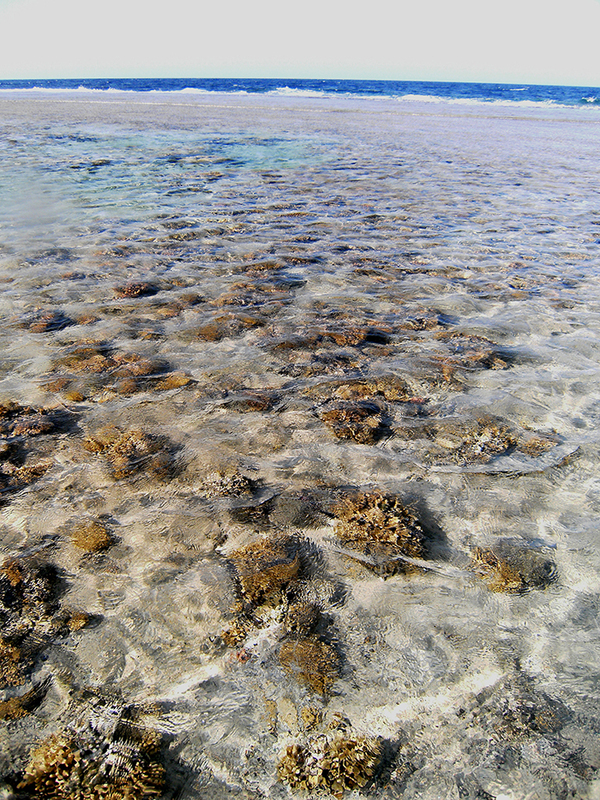 A reef flat at Marsa Alam, Egypt (2009). Here, stony corals such as Stylophora pistillata and hydrocorals such as Millepora spp. are exposed to very high light levels. Photo by Tim Wijgerde. 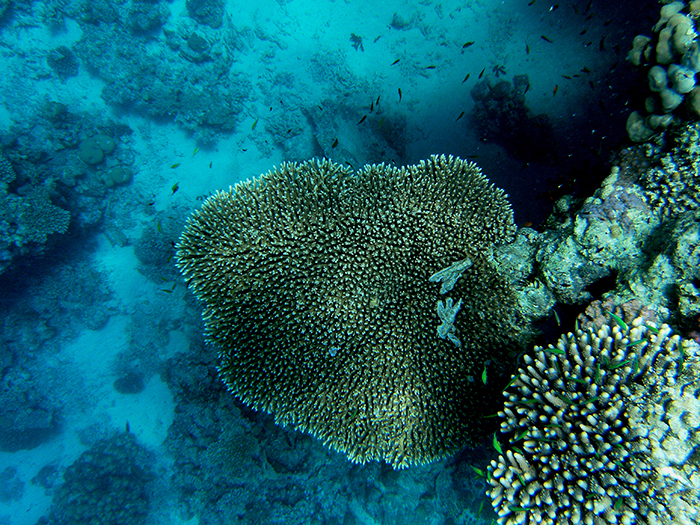 As I mentioned, reef–building and soft corals also grow in deeper waters. Below 333 feet (100 meters), corals receive less than 1% of the sunlight present at sea level. To adapt to this dark environment, zooxanthellae produce more photopigments such as chlorophylls to efficiently harness the feeble light they receive. The coral skeleton also acts as an efficient light collector, scattering light in such a way that the zooxanthellae can effectively use it. In addition, corals alter their morphology, growing laterally flattened branches, plate–like growth forms and more widely spaced corallites, most likely to collect more light. Corals are so sensitive to visible light, that they can detect it at an astoundingly low irradiance of 0.002 µmol m–2 s–1, allowing them to sense sunlight at great depth and faint moonlight in shallow water. Deep–growing corals can also feed on plankton, detritus and dissolved matter to compensate for the decreased amount of nutrients obtained through photosynthesis. Additional nitrogen obtained via feeding also allows zooxanthellae to persist at very low light levels. An Acropora colony growing in the waters of Ra’s Qul`an, Egypt. Although the genus Acropora is often associated with brightly lit, shallow reefs, its members are found down to at least 243 feet in depth. Photo by Tim Wijgerde. 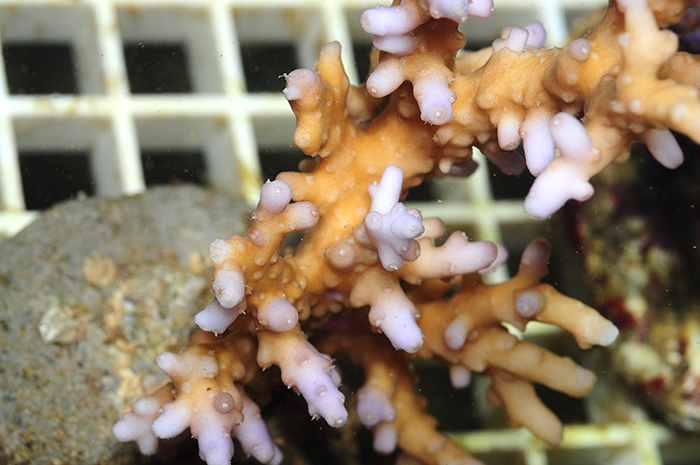 Corals from deeper waters often display altered morphologies, such as more widely spaced corallites, as possible adaptations to a low light environment. Photo by Tim Wijgerde. The spectral quality of light also changes with water depth. As we move deeper into the ocean, sunlight is filtered by seawater. Red light, having the longest wavelength and lowest energy photons within the visible spectrum, is quickly diminished by seawater. It penetrates no more than about 33 feet (10 meters) in tropical seawater, although this value varies with location and time. At a depth of about 133 feet and below, orange, red and infrared light (>590 nm) do not penetrate. Thus, seawater acts as a color filter, with blue and green becoming dominant in deep waters. Adaptation to a blue environment ties in well with the finding that corals and zooxanthellae thrive under blue light alone when cultured in aquaria. For zooxanthellae, this holds true in hospite (growing naturally in the coral) as well as ex hospite (living outside the coral, in culture flasks). Interestingly, corals from deep waters also use blue light more effectively for photosynthesis than shallow corals, providing evidence for chromatic adaptation, i.e. adaptation to a specific light spectrum. This adaptation may occur via increases in the synthesis of various photopigments by zooxanthellae, such as chlorophyll a and the carotenoid peridinin. 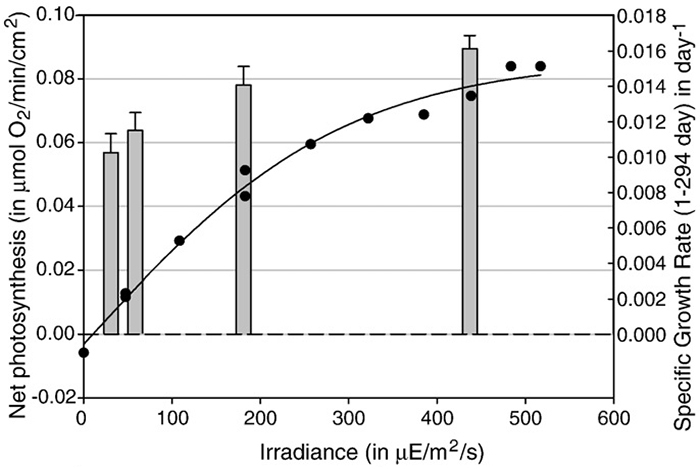 Irradiance profiles (395–665 nm) measured in coral reef waters in Eilat, Israel. Red and orange (not shown) wavelengths do not penetrate deep into seawater, resulting in blue–green water beyond 10 meters in depth. Adapted from Mass et al. (2010). Measuring and Interpreting Light Intensity in Aquaria By now, it should have become clear why measuring light intensity in aquaria is useful. To measure is to know, allowing the aquarist to select the optimal environment for corals within a tank. Although common sense and experience will get you a long way, if you can borrow a PAR meter (such as those made by Li–Cor), it’s always insightful to measure what’s going on in your aquarium. The same goes for light spectrum, which can be measured with a quality spectrometer. However, as these devices are highly expensive, going by the manufacturer’s spectral documentation (and tweaking software) will go a long way for most aquarists. 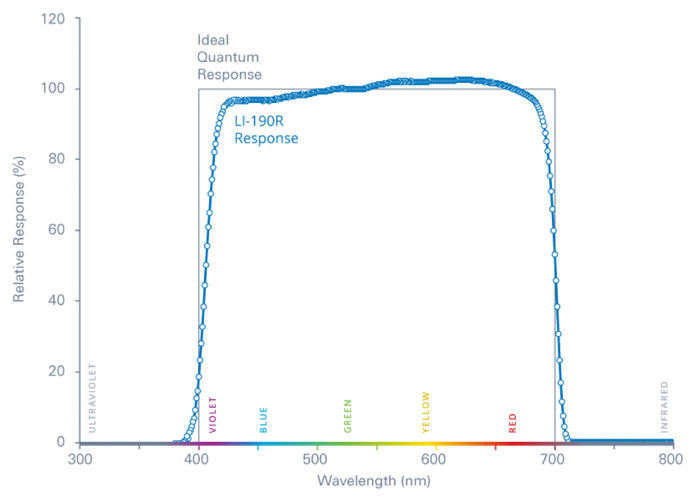 The spectral range covered by a Li–Cor sensor, which overlaps well with photosynthetically active radiation (PAR). This one is designed for measurements above water, although underwater sensors also exist. Image by Li–Cor. As light is a complex topic, I have produced a table to help the aquarist interpret PAR values measured in the aquarium. Note that the information below has been generalized for practical purposes. Generally speaking, we can state that a light intensity of 100 to 500 µmol photons m–2 s–1, ranging from the bottom to the top of the aquarium, is sufficient for good coral growth and coloration. Higher values are possible, which will further enhance growth and coloration in many Acropora spp., for example. It is important to keep in mind that the higher the irradiance level, the higher water flow rates should be to prevent excessive light stress. The brown tinge of reef building corals is due to symbiotic zooxanthellae living in their tissues. Photo by Tim Wijgerde. Table 2. 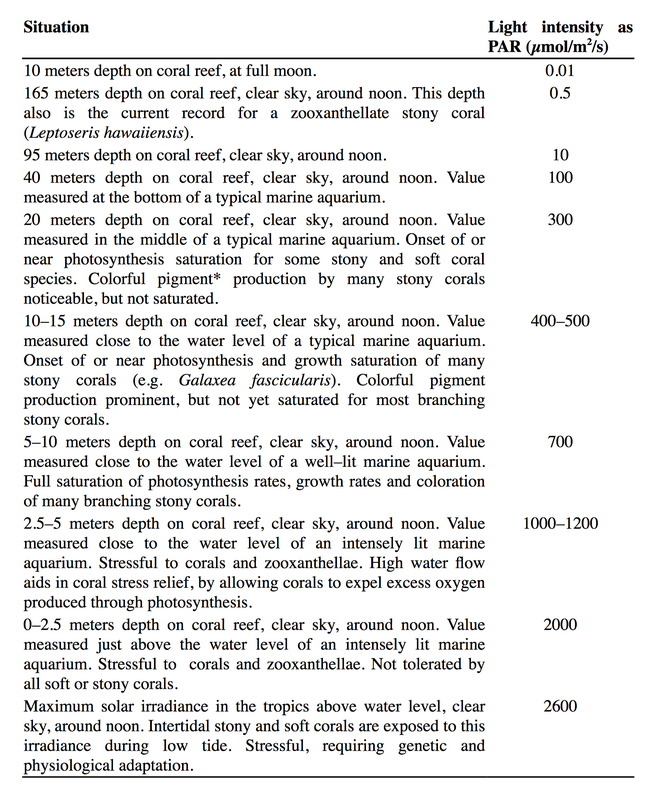 Overview of various relevant situations and corresponding light intensities for reef–building corals. *Bright coral coloration is caused by fluorescent proteins (FP’s such as GFP, Green Fluorescent Protein, and their relatives) and non–fluorescent chromoproteins (such as in Seriatopora hystrix and Stylophora pistillata). These proteins are thought to protect corals against excess light and cellular damage by excess oxygen and other harmful compounds. Interestingly, corals also seem to use these proteins to enhance light–capture in dimly lit, deep waters. Concluding Remarks Although this article may not qualify as light reading, I hope it will be of use to aquarists around the world. Light will always be a complex, yet important aspect of the salt water hobby, so I advise that aquarists try to understand the basic concepts of light intensity and spectrum. This will allow them to better select the appropriate light source for their aquarium and its inhabitants. 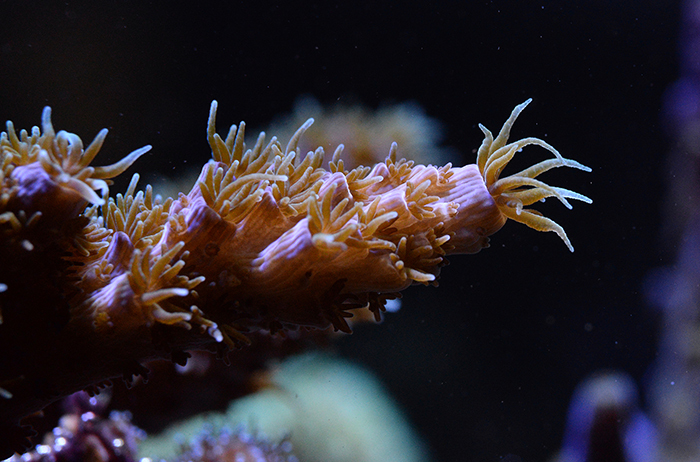 Although a complex topic, a basic knowledge of the properties of light may benefit your aquarium corals. Photo by Tim Wijgerde.